Lower Deck view out to beaches and hammock swing. Marsh view of our beloved saltbox home near Minister's Point. Dining Room view into LR and new Samsung UHDTV. Back yard adjacent the salt pond and meadow. Private sandy beach and boardwalk to tide pools, salt creek.. SINGLE FAMILY SIZE ONLY/ 6 Overnight guests, max., plus daytime 2 visitor guests max. Upscale Chatham beach house in serene and charming North Chatham with breathtaking water views from all rooms--save one downstairs bath! Sweeping views from the upper and lower decks of this ''upside down'' lovely redecorated home--with living/dining rooms upstairs. Four bedrooms all with water view sleep 6 guests ( FIRM), total. Repainted rooms- relaxing colors. New Pottery Barn single = twin utility fourth bedroom boasts new memory foam bed. Cape themed tile guest full showered bathroom downstairs. NEW AC, 3 car Max. overnight. No street parking. The second king bed may convert to twins if needed. Holidays 4 nite minimum. 3-4 night Min. in shoulder and last minute Summer listings. Cape's Best Outside shower just 12 steps near, adjoins tidal salt pond, scenic salt marsh, and birding area. 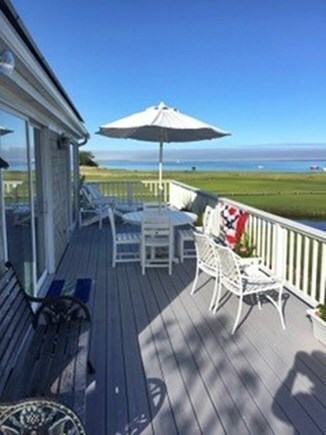 Surf sounds, new Cut with surf views, our Salt Pond reveals herons fishing... Light and airy, this beach house on Chatham Harbor has a large growing private Sandy beach, stunning warm southern water views to ''the Old Cut, and the new 2007 North ''Break'' and the Atlantic. Clean and pristine surroundings. Blue Herons, Egrets, and surf sounds await you. 1+ acres of privacy; adjoins acres of conservation land. Enjoy beach fishing for stripers, windsurfing, and fishing in front. 2 Stand Up paddle boards and 4 Bay kayaks can be launched from the house area. Must use life jackets- harbor tide currents often very strong. Pond in front offers gentile warm waters, perfect for toddlers, sand castles, minnowing. Maximum parties 6 Overnight / 6 guests MAXIMUM on beach. Our strict policy keeps house tidy, neat, and comfortable. Built-in vacuum for touch ups! Please email, or call before 9pm EST, with your EXACT DATES and size/ names of your party. 6 guests total. 3 guests cars max. No street parking. Added dinner/ meal guests max.3, no overnight 4th car or guests beyond 6. Minimum Stays: 3 night minimums. You will have a memorable vacation in serene North Chatham. Also, a large lockable storage shed is available to occupants, bikes excluded. Your beds will all be made up fresh, with plenty of beach and regular towels. Please LAUNDER as much as possible the night before departure and the morning of departure. Its OK to leave last loads running for the cleaning staff. Security Deposit $500, refundable. Cleaners Fee $150. Occupancy by more than 6 persons overnight, or by more than 6 total guests on beach forfeits security deposit and may terminate lease prematurely. We are not a party house but a family Cape experience house with like minded neighbors who do not rent. ( Plenty of town homes and beaches have capacity for larger parties, but our beach agreements do not permit this). Occasionally we lease to family with 1 beloved small dog. Pet Fee $150. Sorry no Cats- allergy issue. Additional availability info: Off season start/end days can be Flexible -quite often eg. Thurs. or Fri to Mon. Long-Term Rental (1 month or more): 6 overnight or Beach Guests. 3 car overnight max. LIMIT Strictly enforced. External only AT&T video surveillance secures the home's entrances. Additional pricing info: Off Season 3 nites: $550/ nite to $650/nite shoulder season; Cleaner $150. Security Dep. $500- ref. State and local taxes of 12.45% will apply. 6 overnight or Beach Guests, Strictly enforced.